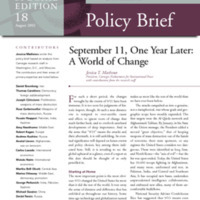 While it is too soon for judgments of historic import, this special edition policy brief takes a look at the immediate effects that 9/11 has had on many fronts including the economy, the environment, globalization, and the U.S. relationship with Russia, China, Central Asia, South Asia, the Middle East, and Europe. The brief also considers how future events and key policy choices will dictate the eventual significance of 9/11. “September 11, One Year Later: A World of Change,” September 11 Digital Archive, accessed April 18, 2019, http://911digitalarchive.org/items/show/2878.